Black colored glossy shell Locket with the image of Luang Por Solos of Wat Koke U Tong, filled with Sacred Maha Sanaeh, Maha Lap and Kong Grapan powders, with a Taw Waes Suwan Asura King Deity Loi Ongk Statuette inserted into the Rich and Highly Sacred Powder Base on the rear face of the Locket. 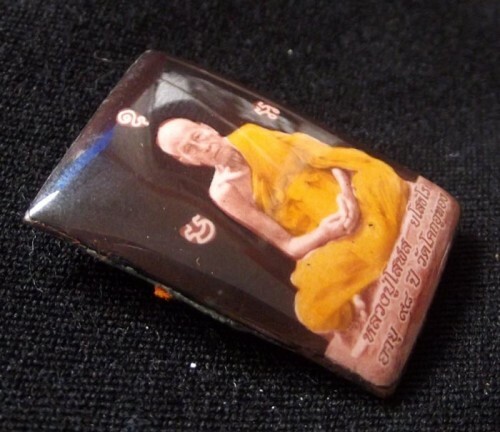 A piece of Luang Por’s Civara Robe is also attached for the Faith of the devotee to have an object to connect with the Mind of the Guru. The Sacred Khom Agkhara ‘Ma A U’ for the Buddha, Dhamma and Sangha are inscribed around the image of Luang Phor, who sits in meditative position. The rear face is filled with Sacred Muan Sarn of various varieties, with some Hair of Luang Por Solos srinkled into the powders. The Asura King of the Northern Quarter of the Jadtu Maha Rachiga Realm, Lord of Wealth and Commander of the Yaksa, is inserted into the Muan Sarn Powders. Wealth and Business Improvement and Protection from Black Magic and Demons is afforded by Lord Waesuwan. 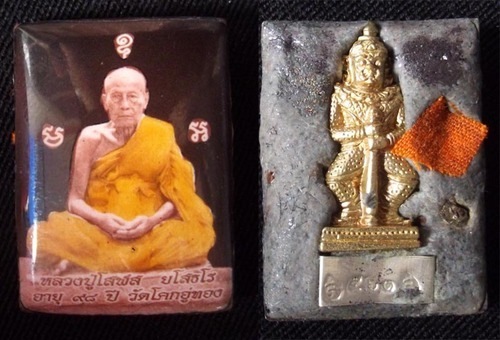 A piece of Civara Robe of Luang Por Solos is also attached, along with a metal stamp with the numbered code of the edition. 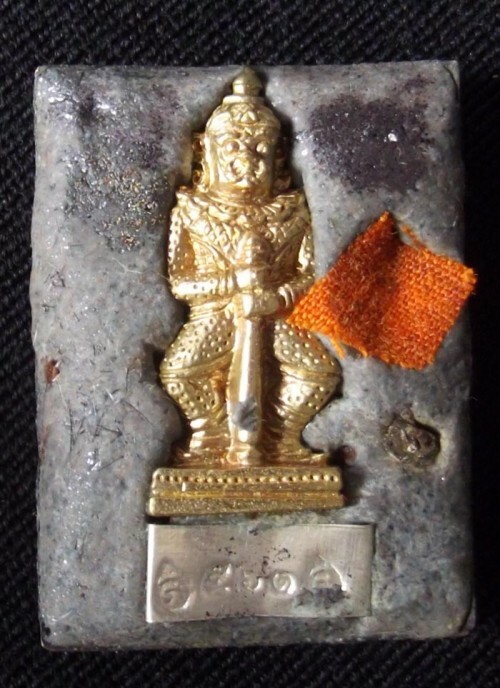 Taw Waes Suwan is made from a smelted Sacred Chanuan Muan Sarn from ancient metallic artifacts, and individually empowered before insertion into the Locket, and subsequent further empowerment. Released after a Traimas (Trimester) Empowerment and Putta Pisek Blessin in the 2555 BE Celebrations for LP Solos’ 98 Birthday.